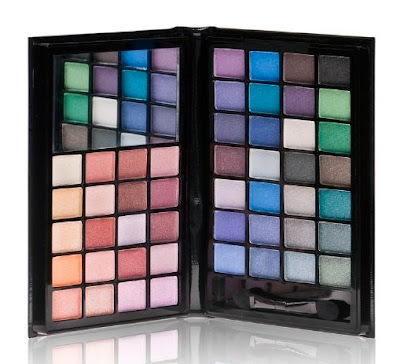 *Giveaway* - Elf 48pc Eyeshadow 'Beauty Book' Collection - CLOSED!!!! Good evening my lovelies, I decided to post my new giveaway up a day early just as a little treat to you all! I recently reached over 9,000 subscribers on my Youtube channel and I thought this would be a nice way to celebrate! I prefer posting small giveaways like this on my blog, rather than my Youtube as it gives a chance to more people to win. I'm giving away a fabulous 48-piece eyeshadow collection, from one of my favourite beauty brands; ELF! I bought this last week, along with a few others bits that'll be up in a haul post during the week. I always find eyeshadow palettes so exciting, and this one in particular is stunning! Equipped with stunning neutral and coloured shadows, it's a must-have for any beauty junkie (and it's ideal for a beginner, also). After reading a ton of reviews of this palette, I've heard it's AMAZING - all of the shadows are highly pigmented, and the palette itself is quite large. You MUST be a follower of this blog to enter - click here to follow! Leave a comment on this post with your name, email address and what blog posts/videos you'd like to see from me this year! You can enter only ONCE on this post! YOU STILL NEED TO COMMENT ON THIS POST FOR YOUR TWITTER ENTRY TO BE VALID! This giveaway is open INTERNATIONALLY ! A winner will be chosen at random, via random.org.